I have a love affair with kabocha ! 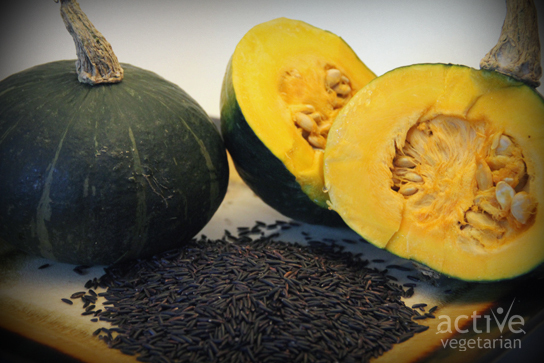 This squash also known as Japanese pumpkin – is the undeniable, and often overlooked delight. If you’ve encountered this unassuming gem, it has most likely been that buttery component of a Thai curry you just couldn’t place or a veggie tempura. Kabocha is like butternut squash’s sadly under appreciated sister. A single cup of kabocha has forty calories compared to butternut squash’s 60, and has less than half of the carbs of butternut squash (7 grams vs. 16 grams). But, it tastes better… the perfect substitute. Kabocha squash is an excellent source of beta-carotene, owing to it’s bright orange flesh, which can be converted to vitamin A in the body. Vitamin A is important for healthy white blood cells, good immunity and for vibrant eyes, skin and hair. 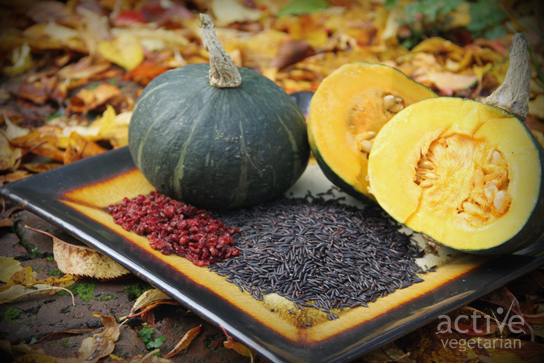 A single serving of kabocha squash provides 70% of the day’s recommended requirement! Kabocha is also a good source of iron, vitamin C and some B vitamins. You can eat the peel! And it is soft and delicious. It’s incredibly versatile. Kabocha can be roasted in the oven simply (perhaps with a dusting of cinnamon) or can create a creamy base for any soup. The world of desserts can also be explored with this ‘pumpkin’. And here comes our creation……. Preheat the oven to 375ºF. Cut a small slice out of the bottom of each squash half so they can lay flat. Place the halves cut side down on a baking sheet and place in the oven for 40 minutes, or until the flesh is tender. Meanwhile, heat 1 tbs. of olive oil in a saucepan over medium heat. Add the minced garlic and stir for one minute. Add the black rice blend and stir to coat in the oil. Take the saucepan off the heat and pour in 1 ½ c. water and salt. Return the saucepan to the heat, turning it up to high. Bring to a boil, then turn heat down to low, covering the pan and allowing it to simmer for 20 minutes, until the rice is tender. Add the dried cranberries, and chopped kale, stirring until the kale wilts down. 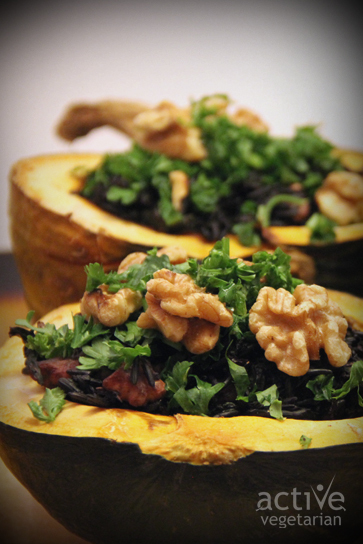 Remove from the heat and stir in the wakame and dry roasted walnuts . For the dressing, peel the piece of ginger root put it in a food processor or magic bullet together with olive oil, peanut butter, soy sauce and vinegar. Process until you get a smooth texture, add water if needed. Pour dressing over rice mixture. Once the squash halves are cooked through, remove them from the oven and carefully turn them over in the pan, so they lay cut-side up. Stuff the four halves with the rice mixture. Return to the oven and cook for another 10 minutes. 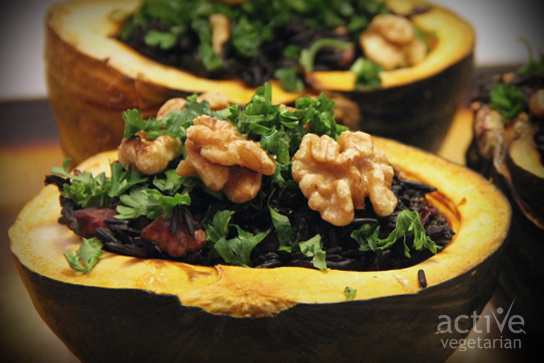 Remove the squash and sprinkle with more walnuts and parsley to garnish.